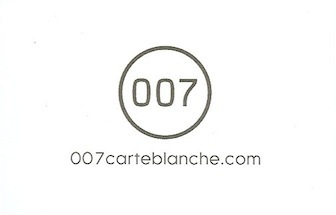 My handlers at Hodder have sent me a terrific Carte Blanche mission kit today -- including a nicely embossed 007 folder containing the press release, a slick official website card, and a Technika MP4 player with the Carte Blanche title and cover reveal animation. Very nice! And it did not self-destruct in 5 seconds. Carte Blanche by Jeffery Deaver will be released on May 26, 2011, and can be pre-order now at Amazon.co.uk.